I hope over the next semester, readers will start to notice the same students appearing in the comic over and over again. 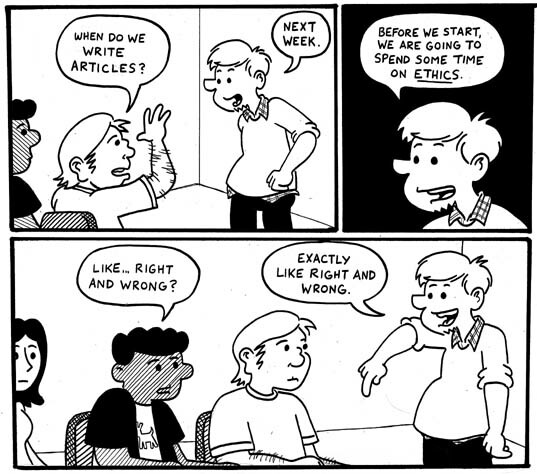 For example, two of these three appeared in this comic last week. 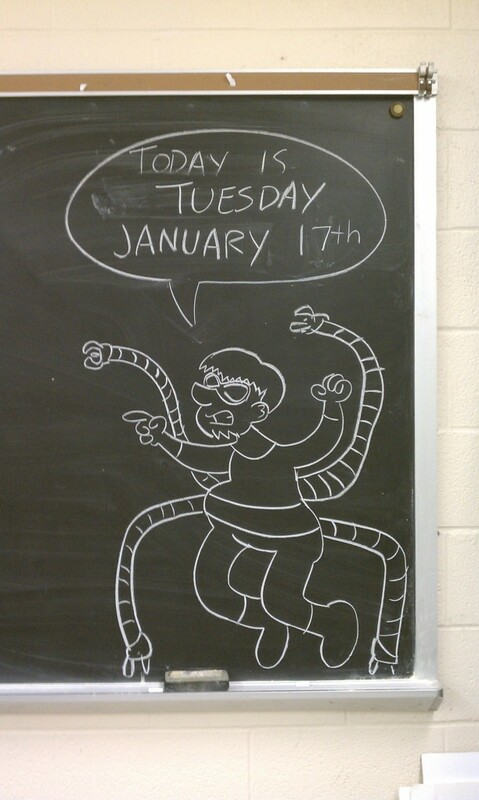 I teach something like 160 students every day. I always felt it was disingenuous to add too many recurring student characters here. I did it a few times to varying success, but I wanted to give the feeling of there being tons and tons of kids… and just me. I’m sure that did not come across and I’m happier focusing on the 15 or so recurring students you’ll see throughout the next four months. Most of these ethical dilemmas came via The Book of Questions, that classic repository for debate and commentary. I used to use it ALL the time in college to stir up conversations with people in the dorms. 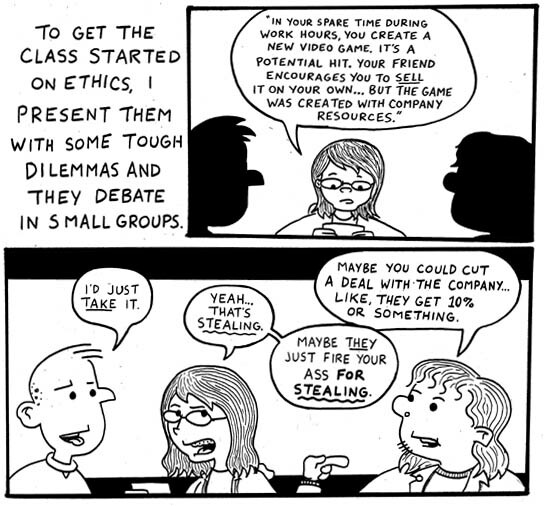 I sort of like this comic, but (full disclosure here) doing comics where I set up what we’re doing in the week are sort of unnecessary and definitely a crutch. In theory, if I’m doing these things right, tomorrow’s comic should be able to set things up simply by being about the topic I want to discuss this week. It’s an all Spider-Man villain theme week! I am not often shocked by the books I find in the thrift store. There are certain types of books that people willingly donate to Goodwill, just as there are books that bibliophiles keep treasured and would never give away. Similarly, when I’m looking for comic paperbacks, I expect to find certain types and kinds of these trades. As a fan of comics, I already know which books I’m likely to come across in a thrift store, either due to popularity of the comic or the noteriety of the cartoonist. Although I stress emphatically I am no academic when it comes to comics, I generally know what to expect. For example, I will find a lot of Family Circus comic paperbacks, because they are inoffensive and many children buy them, read them, and their parents donate them after they’re grown up. A Family Circus paperback is easy to anticipate. That’s the long way around saying I was pleasantly shocked when I found this book. Office Lover Boy by Stan and Jan Berenstein, published in 1962 by Dell Publishing. All these books cost me less than $7 dollars. I bought them from Hastings, a regional merchant of new and used books, movies, video games, and all sorts of other things. I’ve made some really fun purchases from Hastings before (see my Halloween decorations post for more on that) but this past week they had a 30% off Used Books sale… and since Hastings always has free shipping for books, I indulged $7 bucks worth. 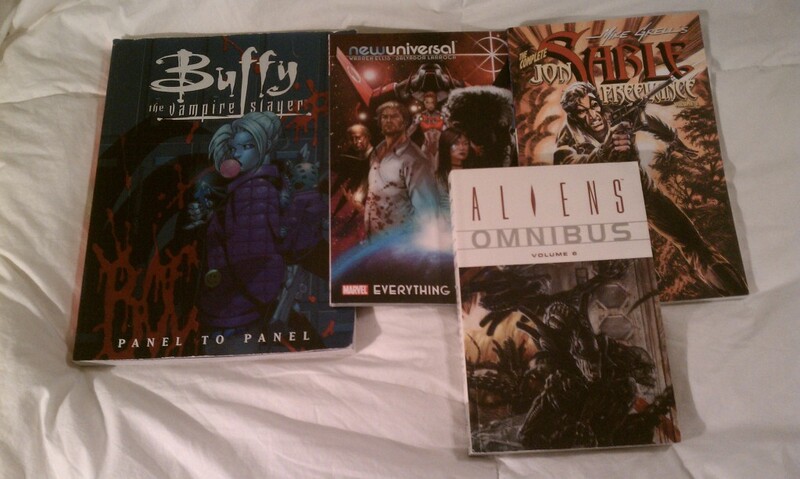 The Buffy: Panel to Panel book is usually $15 to $20 dollars in stores… I got it and three of these other books for like a buck and a quarter. Ditto all the other books save for the Aliens Omnibus. I believe that one set me back like $2 dollars… but we all know how much I love the Aliens franchise. Most of these are books I’ve been wanting to check out for awhile but haven’t had the money or the time to give a shot… Jon Sable: Freelance being at the top of that list. In fact, the only dud of the bunch was the NewUniversal trade, which I bought on the strength of Warren Ellis’ writing. Still, at $1.25 or so, I don’t exactly feel cheated about not liking the book. I mention Hastings here because I had a really good experience with the company and highly recommend them. The books came in like-new condition and they were shipped to me in like a day and a half. Hastings does sales all the time so it might be worth bookmarking them and/or checking back from time to time. 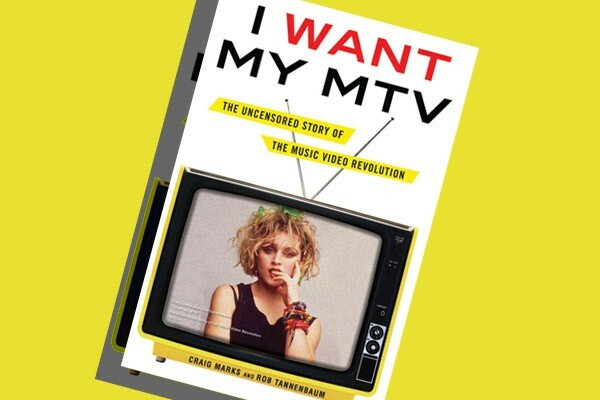 Besides my Hastings orders, I’m also making my way through the addictive I Want My MTV: The Uncensored Story of the Music Video Revolution by Craig Marks and Rob Tannenbaum. This is an “oral history” book very much like the seminal Please Kill Me: The Uncensored Oral History of Punk Music, or the more recent Live From New York: An Uncensored History of Saturday Night Live. Marks and Tannenbaum interviewed hundreds of personalities, executives, and talent involved with the golden age (1981 to 1992) of MTV. The results are engrossing, especially if you remember the channel from its’ music-playing heyday. I watched MTV regularly during the early 1990’s (early enough to appreciate the book’s later coverage of Nirvana and Pearl Jam) but I also remember being a kid and scouring the channel during their “all music, all the time” period. My tastes back then were limited to Michael Jackson, any video employing animation (Take on Me, Sledgehammer, You Might Think), and Weird Al cuts… but there was something to be said for the format, where the randomness of what videos played and when demanded you sit down and watch for hours at a time. One of the book’s virtues is that it doesn’t seek out many of the big names you associate with MTV; you won’t find candid sit-down interviews with Madonna or Bruce Springstein here. Instead, you’ll find those superstars’ stories being told by the rank and file who surrounded them and I think that’s a pretty apt way to look at those folks. The secondhand nature of the stories shared here extends the air of mystique those performers carried with them then and now. At any rate, it’s a good read. It will make you think about Alan Hunter for the first time in decades… but it will also make you think of Kennedy for the first time in decades as well, so I don’t know why where I’m going with this. 1. I’m sorry for overusing the word “always” in this comic. It happened. I saw it. I didn’t fix it. My apologies. 2. Our discussion of “word of mouth” was made unexpectedly interesting this past week with the passing of former Penn State football coach Joe Paterno. His death was falsely reported on Twitter and spread like wildfire on this Saturday past. Paterno’s family made public statements that Paterno was still fighting. He did succumb to lung cancer on Sunday, but it was an interesting lesson on the nature of news reporting on social networking services. 2011-2012 school year: pie chart! Seriously, folks… newspapers are DEAD after my generation. It breaks my heart… growing up, I lived in a “three newspapers a day” household (The New York Times, The New York Daily News, and our local paper). I would by the Daily News with my own money because I wanted to know what was going on in NYC. 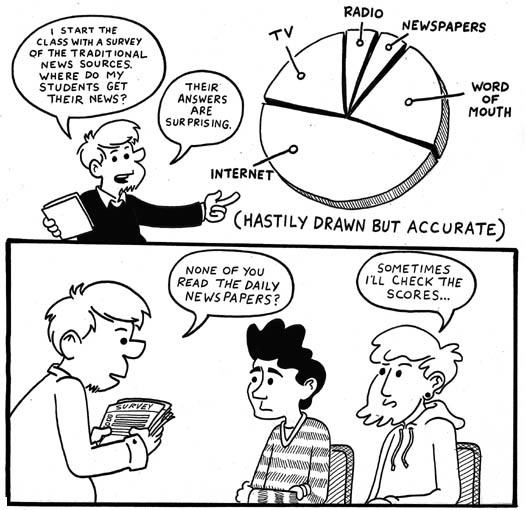 By and large, my students have no need or interest in picking up a traditional newspaper. I guess I’ll talk about this a little bit more as we go further with these journalism class comics, but man oh man… goodbye print media. You are currently browsing the Teachable Moments blog archives for January, 2012.